The school day ended hours ago. I could go home, but traffic is peaking. I have no plans and no one waits for me. For a moment I remember how it feels to be welcomed home, and then I let it go. There is certainly plenty of work to do, evaluations to complete and meetings to plan, but my motivation is low. I hear the tap, tap of my assistant’s finger tips on her keyboard and wonder . . . why is she still here? I want to be alone. I move away from my computer and the mess on my desk, and open my laptop. I glance at some writing I started last night, but they are not the words I want to say today, so I leave them for a bit and instead I click through old photographs. Soon I am lost in memories and stories. I sigh and feel as though I’ve lived a hundred lives. I find a picture of my dad behind the steering wheel, taken by my mom. 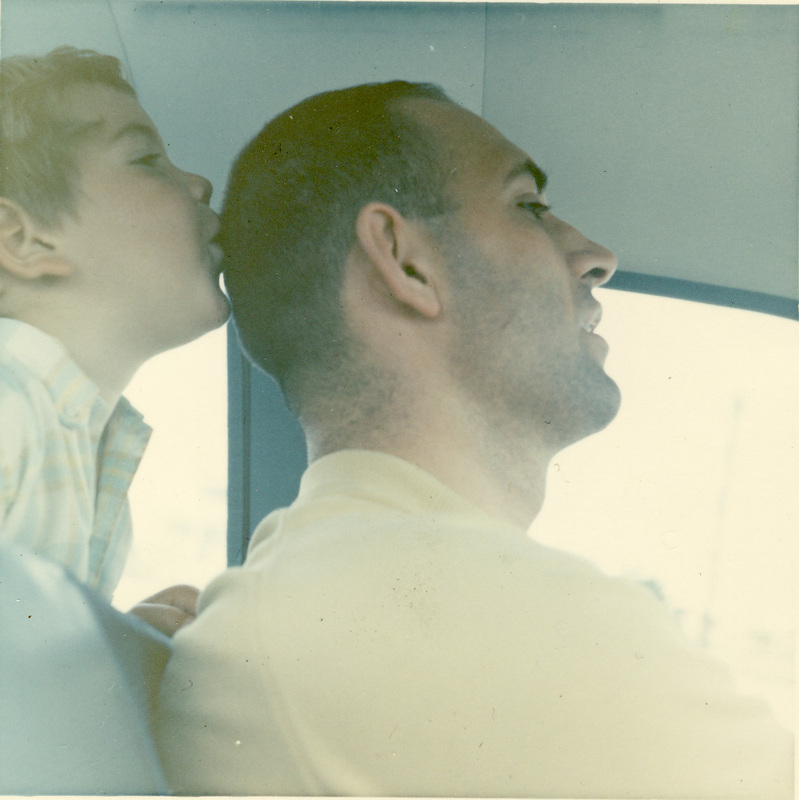 My brother, probably three or four, stands on the back seat, and leaning forward is kissing the crown of my dad’s head. I smile remembering that each one of us kids found ourselves in this familiar place, either kissing my dad’s head, his baldy as we called it, or giving him a little scalp massage. This occurred whenever we were in the car together, particularly on long road trips. Car rides were always filled with singing, causing my dad to shout above the noise when requesting that one of us indulge him. Without seatbelts, we would climb over one another to take a turn at his noggin, still singing. Over the course of their marriage, my mother probably took no less than fifty photographs of my dad from her place in the passenger seat, as his navigator, his co-pilot. I never asked or even wondered why she took so many similar pictures of my dad. I accepted them as a part of our photographic history, pasted in albums next to pictures of us kids leaning on a Giant Sequoia or climbing the sand dunes of the Oregon coast. Even after we kids were grown and gone, my parents continued their road trips, and my mom continued taking driving pictures of my dad. Today, I look at this picture differently, more aware of the light, the lines, and its story. I see it all through my mother’s eyes. Her body turned toward my dad as he drives, her low back pressed against the passenger door’s armrest. With both hands she hold her heavy Mamiya portrait camera as it rests on the crook of her bent leg. Squinting slightly, she brings the image into focus, her long thick waves fall forward. She is steady . . . click. Somehow I feel my mom’s heart in my heart. I feel the story the photograph tells. We are all together, my mom is doing what she loves most . . . getting away from the city, spending time with her family, and listening to her children sing. And then I realize for the first time, she took those photographs of my dad for only one reason . . . she loved his handsome face . . . Your stories are so special, Christine, and your writing makes me feel as if I were there. Talent and sincerity- that’s you! I see exactly what you mean. It brings tears to my eyes. Very sweet and wise. You make me smile. Oh my… Left me a little misty eyed here. What a beautiful post. As always im feeling multiple emotions as I read your post,. One moment I’m reminiscing with you, smiling, then tearing up, then laughing and feeling lucky to have such loving family. Your last words startled me into “of course-ness”. Her love for that exact profile in that precise situation is obvious to you now. What a gift from the heavens from her to you this day.